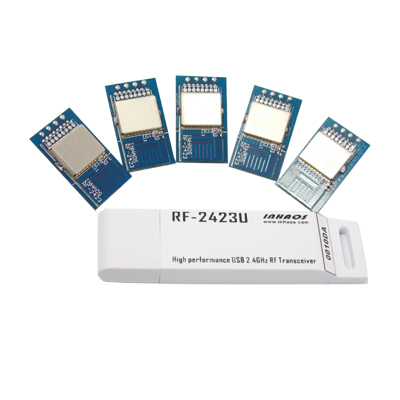 The RF-2400 series module which was launched by INHAOS is favored by many users, and this series of products using high performance RF SOC BK-2421. Beken has released an updated version of BK-2423 which has better RF performance and lower power in 2013, and BK-2423 also support 250Kbps data rate in which can get a farther communication distance and more stable RF performance. Therefore, INHAOS launched the RF-2423 series module which using the patch installation process, it is suitable for large-scale production. For DIYer, we launched RF-2423P. This RF-2423P module add an 8Pin 2.54mm Connector, all the users can use the DIY connection easily.